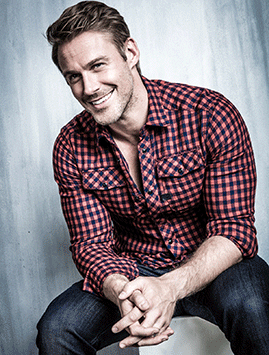 Fitness expert Jessie Pavelka has an impressive track record helping and motivating people to lose weight on TV shows like Sky TV’s Obese: A Year to Save My Life and Fat: The Fight of My Life. The Texan-born former bodybuilder also headed up ITV Daybreak’s Motivation Nation campaign as well as the Sugar Free campaign on Good Morning Britain. Now based in Los Angeles, Jessie recently toured the UK, spreading his philosophy for health through a series of seminars. We caught up with him during his recent visit. Q: Welcome to the UK! Can you give us an idea of what will you be talking about during your tour? Jessie: Well, we’re going to be looking at all the different elements of what makes true health. A lot of the time we just focus on exercise or just on weight loss, so instead we’re going to be looking at different areas like community, nutrition and mind power. Q: You take a holistic approach to health and fitness. Tell us a bit more about this. Jessie: I like to think that good health comes down to four main elements: movement, food, mind power and family. Movement is obviously going to be your exercise and that changes from person to person. We don’t all have to fit inside the same box. Exercise could be a CrossFit class or it could be going for a walk outside. Food is good nutrition. We don’t have to cut out certain foods and deprive ourselves. Good nutrition is fuel to get us through the day. Mind power is about motivation: changing your thoughts so that you don’t wake up and say ‘I can’t’ – you wake up and say ‘I can’. The family aspect is all about community: bringing people together and figuring out who are the key people in your life who care about your success and understand what it is that you want. I encourage people to focus on being ‘strong’. This comes in many forms depending on the person. There is the physical strength, but there is also strength of will. You have to be strong to look in the cupboard and make a good choice; you have to be strong to walk over the threshold of the gym for the first time, or get up early and get moving. Q: Small changes are another part of your philosophy. Why do you advocate this approach in particular? Jessie: The big picture can often become overwhelming when we are looking at where we want to be. At the beginning it can seem exciting but if we have a bad day then that vision of what we want to look like or that number on the scale we want can just become too much. Making small changes each day will help us to achieve our goals slowly and the process becomes something that we can appreciate and enjoy. We are the sum of the small actions we take on a day-to-day basis. If that action is a takeaway meal or a visit to the gym, we become the result of that action. It is that simple. We have to accept this and make the small changes needed, day by day, to live our lives differently. Q: Would you agree that people are becoming increasingly interested in a natural and holistic approach to their health in recent times? Jessie: Yes, I think more so than ever. People are becoming more curious about what is going on inside the body rather than focusing on the exterior and looking good and that’s exciting because that’s what really matters. Q: What is your current workout routine like? Jessie: Well, if I’m travelling and on the go a lot then I try to simplify it as much as I can. Interval training is always really important for me so wherever I can find that 15-minute window to get some training in then I have to take it. As far as nutrition is concerned I try to eat consistently every three hours and keep my body well fuelled. Jessie: I eat a lot of fish right now, particularly salmon. It’s a big part of my protein source. I also eat a lot of quinoa. But it changes a lot. I like to find new foods and give them a try. My son and I, when we go to the grocery store, we try to find something new and exotic – some new fruit or vegetable that we haven’t tried. I think it’s good to discover new foods, new ways of preparing them and new ingredients. Q: Are you a fan of juices or smoothies? Jessie: Yes. I make a very simple smoothie where I blend together frozen berries, a banana, some oats, some cinnamon, some natural protein powder and some almond milk. That’s standard for me and is a quick and simple way of getting some good nutrients in my body when I’m having a busy day. Jessie: I take a multivitamin, omega-3 and magnesium and I also add zinc and vitamin C to my arsenal when I have a cold. I’ll take BCAAs (branched-chain amino acids) when I’m training and sometimes I’ll take L-arginine. Q: Can you give us your top three tips for keeping fit and healthy? Jessie: First, always challenge yourself when it comes to exercise. By that I don’t mean going to the gym and pushing yourself to the limit, but try something different and be open to new things. Find different ways to push the body and take it in a different direction. If you normally work out at the gym for example, try yoga instead. Secondly, explore food. I think we get really stuck in certain ways of eating, so try different things and get excited about food. Don’t always go for the quick option. Take time to prepare your meals and enjoy sitting at the table eating with your family. Lastly, look at the different parts. Look at your lifestyle and the things you are thinking about. How healthy is your mind? There is so much more to good health than just exercise and nutrition.